As Brexit has affected all currency pairs, NZDUSD is also like others. This pair was volatile on Friday as well. After hitting the previous low at 0.69717 NZDUSD rose half way and now it is moving in neutral area. 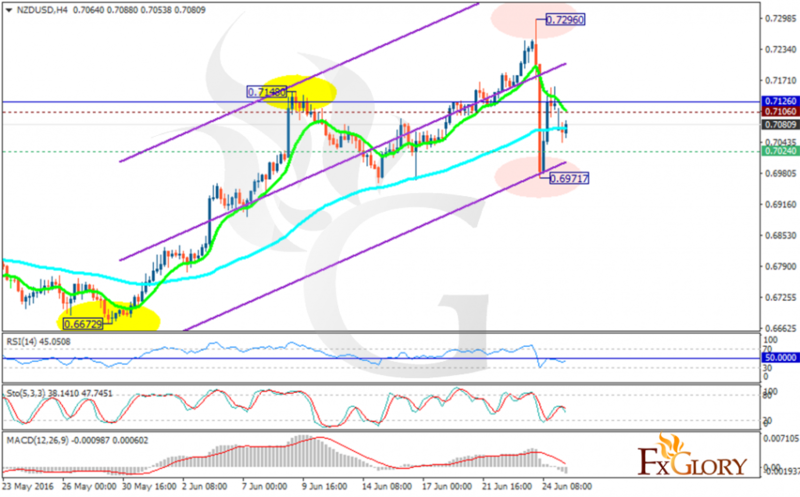 The support rests at 0.70240 with resistance at 0.71060 which both lines are below the weekly pivot point at 0.71260. The EMA of 10 is falling down but it is located above the EMA of 75. The RSI is staying at 50 level and is trying to rise along with the MACD indicator which is in neutral area at the moment. The Stochastic is showing price decline. The resistance level breakout can push the pair to higher levels targeting 0.7250 otherwise the pair will drop to 0.6850.